No matter what you end up calling it, Venice is on just about every bucket list ever written for European travel. Maybe it is the idea that the city is slowly sinking into the sea and therefore has some soon-to-be-vanished appeal or possibly it’s just the idea of gliding along a canal with your loved one that has people longing for a taste of Venice. If you can look past the hoards of tourists, the endless cruise ships and the smell of fish (in the summer) then it actually is a romantic pilgrimage for many. There are some European cities that have a certain images ingrained in our minds. For example, Paris is also supposed to be this amorious city with lovers around every corner. But somewhere in the past semi-century, it seems that this charm has faded away. But I will give Venice this: despite the flocks of people (and pigeons), Venice really has retained that alluring, charismatic atmosphere that we all hope to experience when lost amid cobbled streets. And even better, when you can do Venice on a budget, it makes a destination that much better! Normally, I like to give a “3 days in Rome” or a “One Week in Ireland” type of itinerary, because, as a planner, I like to know what is a realistic time period for exploring. However, Venice is do-able in anything from one to several days! You can cram everything in or decide to take frequent coffee, gelato and people watching breaks and spread your time out. Personally, I recommend the latter, but that is a benefit to the city: you choose what pace you want to go at. Tip: Because there are so many cruise ships docking for the day, many people find that staying at least two days in Venice is ideal. This way, you can linger behind on the canals and have the city all to yourself after everyone else leaves! It comes as no surprise to our regular readers that if we can save a few bucks, we will! 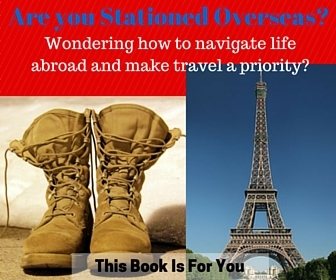 (Want to learn more about saving while traveling, don’t forget to sign up for our monthly newsletter then!) In Venice, this meant staying on the mainland (Mestre) instead of actual Venice (which is actually a group of small islands connected by picturesque canals and bridges). 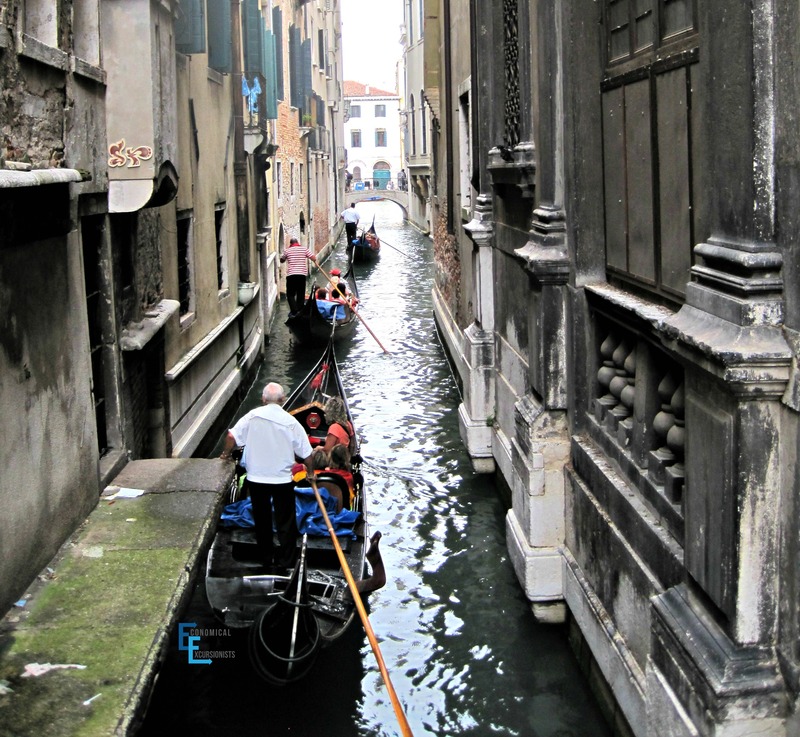 We found rooms and hotels SIGNIFICANTLY cheaper on mainland than in Venice itself. And I mean, hey, the more money I can save on lodging means the more I can spend on Limencello and Gillato, right?? With the bus only taking about 15 minutes and only a few Euro to get into Venice from Mestre, this was a great option for us staying on the mainland. We all know about my (fake) love affair with Rick Steves and it’s really because of his freebies, like his free downloadable walking tours that I can’t get enough of his stuff! (Ok, I’m also a sucker for his corny jokes, too) Nothing beats not having to pay for something actually really valuable! But also, I always just love having context and history to what I am seeing, as it gives a much more lasting impression. He has several free MP3s for Venice and are the perfect addition when at any of the sites around Venice. There are PLENTY of pigeons and it seems the thing to do was to get them to land on you (EW!) Buuut might as well give it a try! How to Do It: The Rick Audio Guide tells you EXACTLY what to do and is perfect to listen to as you drift down the canals. Or, jump on the number 1 or 2 Vaporetto lines (no audio on the boat) and just sit back and enjoy. No need to pay big bucks to see the Grand Canal by water! If you aren’t as big of a tight-wad as us, splurge for a gondola ride. After all, when in Rome (er, Venice) right? Today is the perfect day to just wander around. Your guidebook may instruct you to “Go ahead and just get lost!” Ironically enough though, one of the few times we intentionally just wandered and attempted to “get lost” while traveling was the one time that no matter what, we kept winding back to where we just were! So much for getting lost! However, it was still fun to try to take alternate paths to steer away from the crowds, even if many of them came to abrupt stops ending at the waters edge, turning us right back around to where we came from. Many people want to take a ferry to head to the nearby islands of Burano and/or Murano. I had read that Murano was slightly more touristy and that Burano was known for it’s wine. Less people and more wine? I think you know which one we chose! How picture perfect is THAT!? Take the afternoon to head over to the nearby island of Burano, known for it’s local sweet white wine and homemade lace. The ride is about 45 minutes, so plan accordingly in your day. Personally, I think the best time to arrive is late afternoon (3 or 4). You’ll still have a bit of time to window shop if you want, but by about 5, most of the tourists have already started to head back to Venice and it feels like you have the canals completely all to yourself. 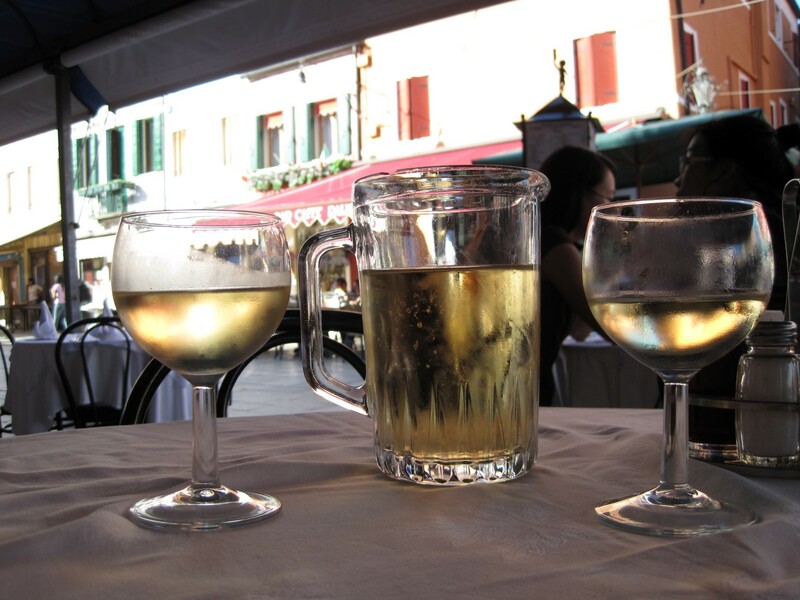 Stop at a local restaurant and grab a pitcher of vino and just enjoy the island with the locals. 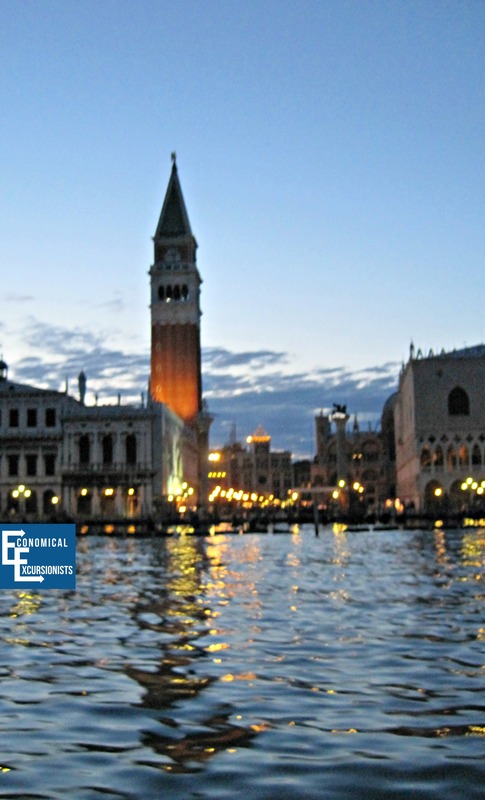 Dreaming of a Venetian Trip? If you are into museums, there are plenty to go to in Venice. 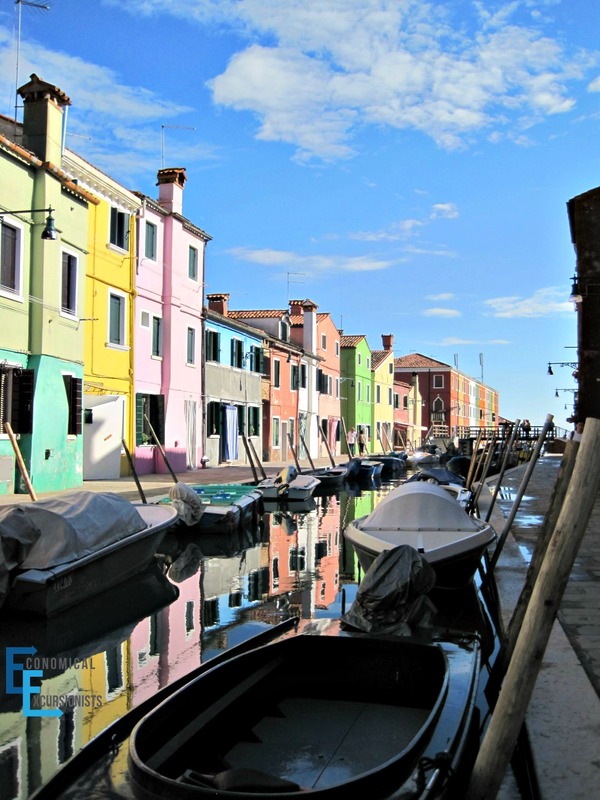 Or, take the same ferry as Burano and head to Murano, known for it’s exquisite glass blowing artisans. If you want to eat outside, along the canal, you may find an extra charge on your bill (and it can be QUITE hefty!). Avoid this by sitting inside or getting off the tourist paths. If you want to be like the locals, order your espressos at the bar. For the same drink sitting at a table, you could be charged more. While Italy is known for it’s wine, enjoy some of it’s other local favorites such as a “Spritz” (Aperol and prosecco) or a Billini. If you need something a wee bit stronger, grab a Grappe (I made the mistake thinking this was a cocktail, let’s just say it’s not and Andy needed to finish the rest of mine!). Of course, nothing beats a homemade Limencello for an aperitif! Great overview of Venice! We are heading there in the fall during an European road trip, so we will definitely save some cash and stay (plus park the car!) on the mainland and just hop on the bus into Venice. Thanks for the tips! Great tips, I have never been to Venice, but you gave me a good overview of the city. This article gave me idea to plan my stay in Venice when I’ll go there. I don’t mind crowds, but pigeons… yuck! Awesome! 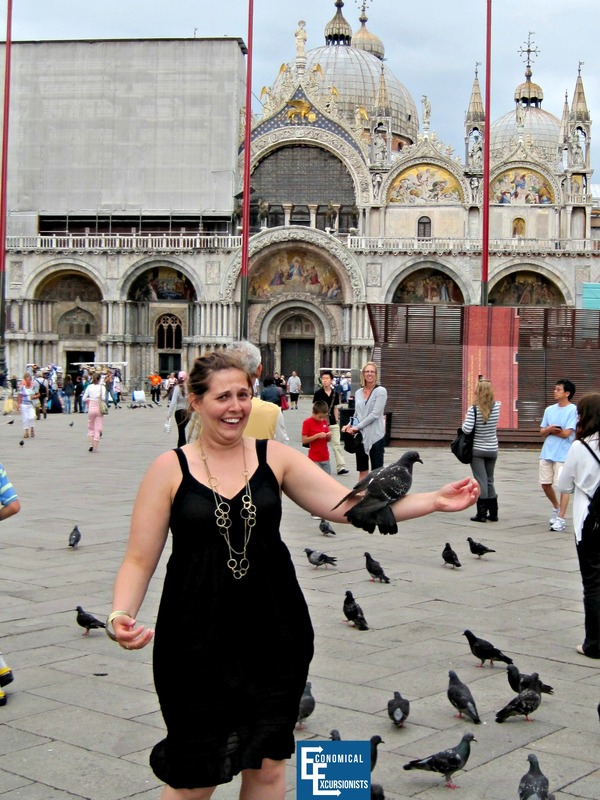 I would say no to pigeons but would love to try the Gondola Ride, the authentic Venice feel. Lovely post with some great tips! Especially the ones about staying in Mestre instead of Venice itself – accommodation is a bit pricier in Venice, but for the convenience of waking up in the beautiful city centre, we felt it was worth it. A friend of ours is heading there next month and I told her the same – price vs location. I think location won out for her too :p Good tip about the gondola rides. Negotiating is key! If you do want a ‘romantic’ gondala ride though, expect to pay through the roof! Sadly we got bunched up with strangers and were left staring at each other from across the boat while the other lovebirds we comfy in the lovers seat at the back! Nice! I’d been to Europe a few times, but never Italy, so I agree, Venice had quite the impression on me as well! I heard the Gondola rides are so expensive – do you know about how much they cost? I’m taking my mom to Italy later this year and she mentioned wanting to go to Venice, I want to make it memorable for her. I should have made a side trip to Burano whilst my stay in Venice! It looks so beautiful and quiet! Thanks for those tips. I’ve heard a lot of stories from different travellers about getting ripped off in Venice and it’s always good to be aware of these things and not fall into any tourist trap. That’s the brilliance of the internet and the dissemination of information. I just wish people would do adequate research before embarking anywhere to avoid unfortunate circumstances. Thanks for all the tips, LeAnna! I think many high-tourist cities have the possibility of ripping off people. But I agree, if you know what to look for and avoid before hand, it can save you a ton of headache…and money!